f.27 Town of Panelim on the south bank of the Mandovi river. bl.uk > Online Gallery Home	> Online exhibitions	> Asia, Pacific and Africa Collections	> f.27 Town of Panelim on the south bank of the Mandovi river. 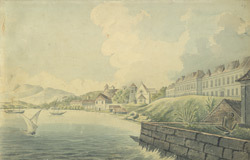 Water-colour painting of the town of Panelim in Goa by John Johnson (c.1769-1846), c.1795 - 1801. This image is from a sketch-book of 36 drawings (36 folios) depicting scenes chiefly in West India and Mysore. c.1795-1801. In the centre of the picture is the parish church of St Peter, and an aristocratic residence to the right. In the background is part of the Dominican establishment of St Bonaventura. Only the church remains today. The Portuguese came to Goa in the 16th century for the lucrative spice trade and dominated the area for four centuries. The region still reflects the influence of Portuguese Christian culture, for example bright white churches can be seen in the centre of nearly every village. Panaji (Panjim) is s small town built on the left bank of the Mandovi Estuary. There were three principal cities in Portuguese Goa; Old Goa (Velha Goa) Panjim (New Goa) and Margao. Panjim was originally a suburb of Old Goa.